Scroll down and click on the video play button. To watch a different bird, use the search tool. Find more animal clips in the playlist. To watch clips about wild garlic (called garlic mustard here) and blackberries, click on the playlist. Watch a video clip and print out a spotters sheet. Find lots more outdoor ideas in the playlist. Click on an activity for a printable to take outdoors. Click on a topic then click on a picture to see a bigger image. To listen to a blackbird, a cuckoo, a mallard and more, click on the birds under "Wildlife Ringtones", or for printable colouring sheets and masks, scroll down. The beautiful pictures in this book are full of wildlife to look out for when you’re outdoors. There are birds, butterflies and plants to spot by a river, in the fields or on a city ramble, and pages on the seasons and creatures to look out for after dark. Children will love browsing the pictures at home — then spotting the wildlife outside. 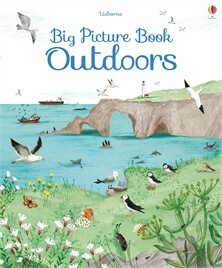 This is an absolutely beautiful book jam-packed full of gorgeous illustrations and information about the great outdoors. It's a great introduction to nature for young children and has lots of things for children to spot in a field, by the sea, near rivers and even in cities. My son likes to have a look through it just before a walk to get ideas of what to look out for.